Age does not matter! Defying this, Prashansha won the title of Glocal Teen Hero 2018 on 1st of September, 2018. She is 17-year-old Youtuber and Social Activist. She is passionate to work on film shooting, editing, post- production and writing script on her own. Not only the entertaining vlogs, she loves to shoot the documentaries that would expose the urgency of the eradication of child marriage. After running different projects on the awareness of child marriage and sessions focusing on the eradication of child marriage, she was looking for something big to create an impact on the larger number of people. Winning the title led her to get an opportunity to take a stronger step for making her dream come true. “Awareness Campaign to End Child Marriage” is an awareness campaign to end child marriage in Rukum and to create good learning and growing atmosphere for children which is free of early marriage, early pregnancy, poverty, unemployment and many more. She has started working in her project from October. The project is about ending child marriage through effective way of awareness. With the initiation and leadership of Glocal Teen Hero 2018 Prashansha KC, the project is organized in collaboration with Zonta Club of Kathmandu and Glocal Pvt. Ltd. The project is about ending child marriage through effective way of awareness. The project is organized in collaboration with Zonta Club of Kathmandu and Glocal Pvt. Ltd; where Zonta is supporting and Glocal is implementing the project. 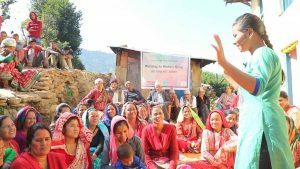 She will be conducting awareness sessions in 2 schools targeting 1200 students of Rukum. The session will focus on discussions about prevention of these marriages, awareness about importance of being employed and educated, awareness about reproductive health, defence, empower girls and women to fight for their rights, awareness campaign to communities about moral and legal judgements. To aware the women, she will be running ‘Workshops in Ama Samuha’. With good parenting skills, it would include all the above sessions. Reaching out more in the community, she will be doing Ghar Dailo program as well. The project will be addressing the benefits of marrying at right age, scope and responsibility of new generation and many more to elderly people. The documentary will be made to potray the lives of victim and execution of project to inform the youth about this problem all over Nepal.